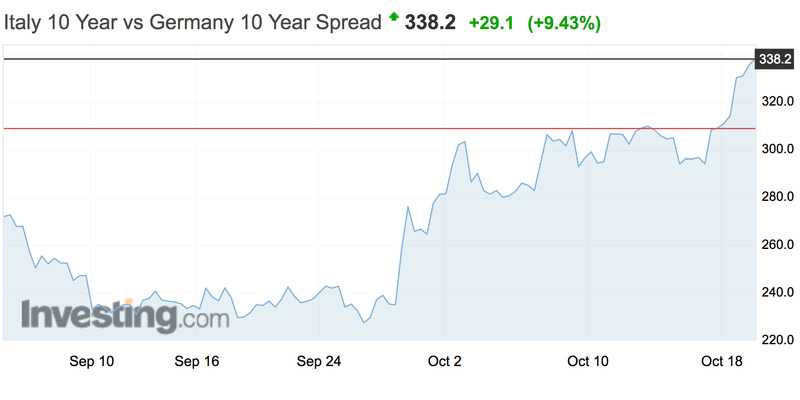 The spread between yields on Italian and German bonds climbed to its highest level in almost five years on Friday. Gap between German 10-year and Italian 10-year now stands at almost 3.4 percentage points. Widening of spread comes as Rome and Brussels clash over Italy’s proposed budget, which proposes breaking EU spending rules. “Moreover, with Italy’s government debt standing at around 130% of GDP, our preliminary assessment also indicates that Italy’s plans would not ensure compliance with the debt criterion benchmark,” it continued. The rebuke has heightened tensions between the two parties, with a confrontation looking more and more likely. That potential outcome has spooked investors, pushing the spread between Italian and German 10-year bonds to its highest since 2013, at the tail end of the eurozone debt crisis. 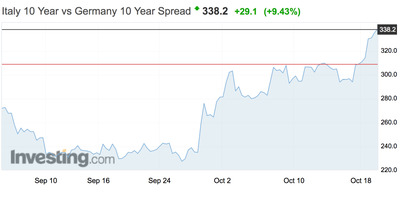 On Friday morning that spread stood at 3.4 percentage points, an increase of close to 50% from levels seen in late September. Germany’s government debt is widely seen as being one of the safest investment vehicles on the planet, thanks to the country’s staunch commitment to running a budget surplus. Italy, on the other hand, looks less and less stable, pushing bond yields higher. For context, the budget proposes increasing both Italy’s overall government debt and its deficit in the short run, pushing the deficit as high as 2.4% of GDP over the coming years. This means Italy will fall foul of a previously mandated maximum deficit level of 0.8% of GDP. Italy was asked to amend its budget by eurozone authorities before submitting it, and was told that the proposals represent “significant deviation” from its mandate. It refused to do so, with the Italian parliament voting to approve the proposals on Monday evening. Matteo Salvini, the leader of the Northern League, one of the two coalition partners in the Italian government, has made clear that the government plans to go ahead with the implementation of its budget proposals, regardless of any opposition from Brussels. “If Brussels says I cannot do it, I do not care, I will do it anyway,” Salvini said last week, referring to the budget’s implementation. Italy has until Monday to respond to the Commission’s findings.